What makes nonviolent, civilian-based movements effective? What are the skills and strategic choices that can make the difference between success and failure for these movements? Will the grassroots, civilian-based uprisings in Tunisia and Egypt continue to spread throughout the region? These questions were addressed by Hardy Merriman, a Senior Advisor at the International Center for Nonviolent Conflict in his presentation on April 20, sponsored by the Program on Negotiation. Using recent events in Egypt as an example, he presented an analytical framework for understanding how nonviolent movements work. Confidence is important for nonviolent movements. 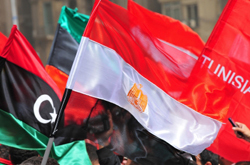 The successful nonviolent resistance in Tunisia in 2010-11 gave people in Egypt and other countries a sense that nonviolent methods may work for them as well. Hannah Arendt provides insight into how and why such methods work: “The sudden dramatic breakdown of power that ushers in revolution reveals in a flash how civil obedience to laws, rulers and institutions, is but the outward manifestation of support and consent.” Nonviolent movements wage struggle based on this insight, understanding that the strategic withdrawal of popular support and consent from various policies and institutions can generate leverage for change. When ordinary people systematically find ways to target their strengths against the regime’s weakness with broad disobedience at key points, they can shift the balance of power in society. When consent begins to be withdrawn, regimes may offer concessions and simultaneously engage in repression, as President Mubarak did in Egypt and President Ben Ali did in Tunisia. However, in certain cases concessions may increase confidence among the opposition and lead to further resistance. For example, in the US, the Montgomery bus boycotts (1955-56) provided a key psychological victory for the civil rights movement to continue in other cities. In Egypt and Tunisia, concessions similarly increased opposition mobilization. Meanwhile, repression proved unable to end resistance and backfired by imposing significant costs on the regimes. When this happens, regimes are put in a compromised position as the cost of their maintaining order is increased. As sustained nonviolent resistance erodes a regime’s pillars of support, the regime’s options dwindle. Splits begin to emerge among the adversary’s supporters—for example, between those who are benefiting economically from the regime and those who are tied to its political institutions. In the case of Egypt, the tourism industry put pressure on political figures for a return to normalcy—even if that meant granting concessions to the opposition—so business would not suffer. Political and business interests, which are usually seen as being in lockstep, started to separate because pressures were applied at the point right between them. In Egypt, a division emerged between lower level security officers and senior level security officers who benefited more from the status quo. Merriman argued that splits such as these may cause the regime’s most loyal supporters to begin to doubt the sustainability of the authoritarian’s rule. Though they might not support the opposition, they may begin to distance themselves from the authoritarian to make sure they are favorably positioned if he were to fall. At such a point, mass defections among the authoritarian’s supporters and increasing distance between the authoritarian’s inner circle effectively coerce the authoritarian to cede to the movement’s demands. Even if the regime calls for repression, orders to do so may not be carried out by the security services. So what accounts for success and failure of this process? Some experts say that movement success is based on exogenous structural factors. These factors can include the amount of political space in a society, income distribution, the oppressor’s willingness to use violence, the education level of society, the presence of a middle class, specifics of a country’s culture and its geopolitical neighborhood. Merriman argues that the outcomes of nonviolent movements are influenced by structural factors such as these but that sometimes factors over which the opposition does have control—namely the skills and agency of the opposition itself—have an even greater influence on the outcome. Such skill- and agency-based factors include developing a unifying vision, engaging in strategic planning, selecting appropriate campaigns and tactics, engaging in tactical innovation and sequencing, selecting specific and achievable objectives, creating effective communications and building coalitions. Nonviolent movements can develop knowledge and experience by understanding why people are loyal to the status quo and targeting those loyalties. Unity of purpose: Is a movement united in ends and means? Unity of organization: Are leaders, mid-level organizers, and local activists unified? Unity of people: Is a movement able to build coalitions and unite diverse groups in society? Has the movement listened to the people they want to mobilize and do they have an inclusive and representative discourse that brings people in? In Egypt, the opposition understood that their power laid in their ability to mobilize diverse constituencies. Although some of the movement organizers were not working class, they emphasized working class grievances in their discourse and organized in working class neighborhoods. They built a collective identity by drawing on shared symbols, nationalism and culture. The movement was also broadly inclusive of women and people with differing religious views, promoting slogans like, “Muslim, Christian, we are all Egyptians”. They also created unity on the level of Egyptian identity and co-opted the loyalties of the Mubarak regime’s supporters, for example through slogans such as: “The Police and the People Stand Together. Long live Egypt.” Before the uprisings, the Mubarak regime was synonymous with the state and if you criticized Mubarak you were criticizing Egypt. The movement used rhetoric meant to reclaim the identity of Egypt by declaring, “We are all Egypt”. Another factor that can contribute to a successful nonviolent movement is a history of past nonviolent actions that helped to ripen conditions in a given society. Although a lot more information has yet to come out about the nature of the Egyptian opposition’s strategic planning, Merriman believes that there was a fair amount of reflection about best practices and failures of past nonviolent mobilizations. For instance, the 2004-05 Kefaya (“Enough”) movement in Egypt helped shift the country’s psychological threshold for public criticism of the regime, and the 2008 April 6 movement built solidarity between young urban populations and labor groups. Both of these and other past nonviolent mobilizations helped to set the stage for the successful January 25, 2011 uprising. On a tactical level there is evidence of extensive planning by the Egyptian opposition. For instance, one of the movement’s main obstacles was getting people physically to Tahrir Square. Mubarak tried to outnumber demonstrators with riot police. Movement organizers mapped out protest routes through the city’s numerous alleyways and organized in undisclosed locations to keep ahead of the police. They also created a twenty six-page pamphlet called “How to Protest Intelligently”, geared at mobilizing people who had never before been involved in nonviolent action. It contained a list of objectives of the movement, simple ideas about how demonstrators should conduct themselves, guidelines on what to wear, and even instructions on how to handle confrontations with riot police. Organizers also understood their capabilities and knew that calling for daily massive demonstrations would exhaust the movement. In other cases of nonviolent struggle, mass demonstrations have collapsed after a few weeks, so the movement leadership in Egypt staggered their mobilization and emphasized action on Tuesdays and Fridays. In the face of pressure to negotiate—many Egyptians were losing income and wanted to return to normal life—the demonstrators also correctly estimated that they could maintain their mobilization longer than the government could resist it. What was also remarkable was that they created a political space for people to organize and maintained a high level of internal self-organization. For example, the opposition had checkpoints in Tahrir Square where people were frisked for weapons, they routinely cleaned the square, and put up defense barricades to reduce the violence. Merriman stressed that the movement’s ability to build an organizational culture of nonviolent action was truly remarkable. If the opposition had directed significant violence at Mubarak’s security services, then Mubarak’s forces would likely have remained loyal to the regime and would have engaged in massive counter-violence, as happened in Libya. Egypt is a wonderful example of the fact that when people remain nonviolent, it allows the movement to be much more expansive. Women, children and the elderly were important players in the Egyptian uprising. Violence decreases the numbers of what a movement can mobilize. Violence also engages an adversary where it is strongest, while nonviolent methods set up an asymmetric conflict in which a unified, well-planned, and disciplined movement holds the upper hand. Hardy Merriman is a senior advisor at the International Center on Nonviolent Conflict (ICNC). He writes and presents about nonviolent conflict both for academic audiences as well as for activists, organizers, other practitioners. He has co-authored or contributed to works such as Waging Nonviolent Struggle: 20th Century Practice and 21st Century Potential (2005) by Gene Sharp, Civilian Jihad: Nonviolent Struggle, Democratization, and Governance in the Middle East (2010) by Maria Stephan (ed. ), and the CANVAS Core Curriculum: A Guide to Effective Nonviolent Struggle (2007). Hardy also serves as a member of the board of advisors to the Meta-Activism Project.